We see in these statements from a time relatively early in Tesla’s life, he was 38 years old and in the most fruitful years of his career, that he is already hinting about a great discovery of his. A discovery about an aspect of nature which seemed to Tesla to hold the possibility of driving motive devices by connecting them directly to the “ambient medium” and to thereby place the “vast reservoir of negative charge” in the service of “relieving a wanting and suffering mankind”. A DEPARTURE FROM KNOWN METHODS – POSSIBILITY OF A “SELF-ACTING” ENGINE OR MACHINE, INANIMATE, YET CAPABLE, LIKE A LIVING BEING, OF DERIVING ENERGY FROM THE MEDIUM – THE IDEAL WAY OF OBTAINING MOTIVE POWER. I was vainly endeavoring to form an idea of how this might be accomplished, when I read some statements from Carnot and Lord Kelvin (then Sir William Thomson) which meant virtually that it is impossible for an inanimate mechanism or selfacting machine to cool a portion of the medium below the temperature of the surrounding, and operate by the heat abstracted. These statements interested me intensely. Evidently a living being could do this very thing, and since the experiences of my early life which I have related had convinced me that a living being is only an automaton, or, otherwise stated, a “self-acting-engine”, I came to the conclusion that it was possible to construct a machine which would do the same. As the firststep toward this realization I conceived the following mechanism. Imagine a thermopile consisting of a number of bars of metal extending from the earth to the outer space beyond the atmosphere. 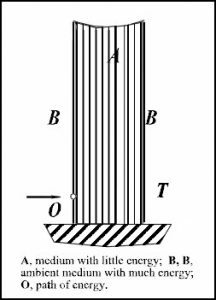 The heat from below, conducted upward along these metal bars, would cool the earth or the sea or the air, according to the location of the lower parts of the bars, and the result, as is well known, would be an electric current circulating in these bars. The two terminals of the thermopile could now be joined through an electric motor, and, theoretically, this motor would run on and on, until the media below would be cooled down to the temperature of the outer space. This would be an inanimate engine which, to all evidence, would be cooling a portion of the medium below the temperature of the surrounding, and operating by the heat abstracted. But was it not possible to realize a similar condition without necessarily going to a height? 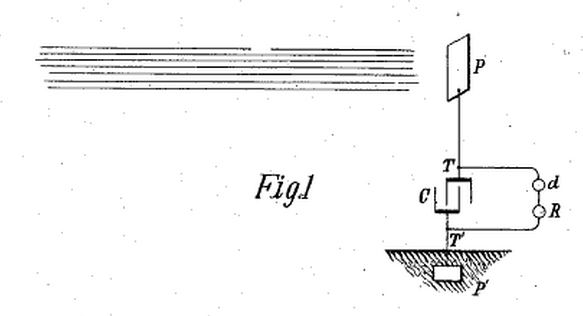 Conceive, for the sake of illustration, [the cylinder pictured above] enclosure T, as illustrated in diagram B, such that energy could not be transferred across it except through a channel or path O, and that, by some means or other, in this enclosure a medium were maintained which would have little energy, and that on the outer side of the same there would be the ordinary ambient medium with much energy. Under these assumptions the energy would flow through the path O, as indicated by the arrow, and might then be converted on its passage into some other form of energy. The question was, Could such a condition be attained? Could we produce artificially such a “sink” for the energy of the ambient medium to flow in? Suppose that anextremely low temperature could be maintained by some process in a given space; the surrounding medium would then be compelled to give off heat, which could be converted into mechanical or other form of energy, and utilized. By realizing such a plan, we should be enabled to get at any point of the globe a continuous supply of energy, day and night. More than this, reasoning in the abstract, it would seem possible to cause a quick circulation of the medium, and thus draw the energy at a very rapid rate. Here, then, was an idea which, if realizable, afforded a happy solution of the problem of getting energy from the medium. But was it realizable? I convinced myself that it was so in a number of ways, of which one is the following. As regardsheat, we are at a high level, which may be represented by the surface of a mountain lake considerably above the sea, the level of which may mark the absolute zero of temperature existing in the interstellar space. Heat, like water, flows from high to low level, and, consequently, just as we can let the water of the lake run down to the sea, so we are able to let heat from the earth’s surface travel up into the cold region above. Heat, like water, can perform work in flowing down, and if we had any doubt as to whether we could derive energy from the medium by means of a thermopile, as before described, it would be dispelled by this analogue. Much later in Tesla’s life, when he was 76 years old, he began to discuss radiant energy in the public forum once again. Given Tesla’s undeniable genius, and given that the state of technology in today’s modern civilization can be traced back either directly or indirectly to the inventive contributions of this one man, I have taken Tesla’s conceptions of radiant energy at their word and set to see if I could find any of his basic concepts on my bench. Vdd (Voltage Drain, positive) as the end point for a given charge path segment. This is aligned with the true flow of charge and opposite of the backwards and confusing (but surprisingly prevalent) “conventional” notation for charge flow. The astronomical degree of electrical force existing between the Earth and the sun is a major source of Tesla’s ever-available cosmic energy, however Tesla noted that other sources include all other forms of energy traversing the cosmos. 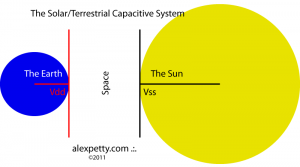 Step 2: In some sense, the energy can be said to flow from the sun to the Earth through a vast dielectric (the vacuum of space) and thus form a kind of capacitor as shown below. One charge path segment’s drain is the next segment’s source and so the Vdd plate above (Earth’s charged ionosphere) becomes the Vss plate in the next step (described below and corresponding to the image below). Step 4: The radiant energy from the sun charges the Earth’s outer atmosphere. Step 5: The earth now acts like a large spherical capacitor. The energy from the top plate (Vss) gives rise to a charge on the bottom plate (Vdd) through the capacitor’s dielectric which in this case in the planet’s atmosphere. The charged Radiant Energy particles from the sun are received by the Earth’s ionosphere. 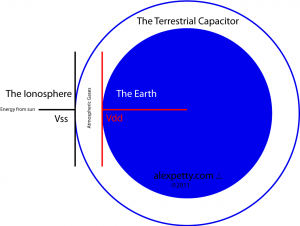 Between the charged ionosphere (Vss) and the Earth’s surface (Vdd, a distance of 60 miles), it can be shown that there is a potential electrical gradient of around 360,000 volts. The gases of the Earth’s atmosphere act as an insulator between these two charged “plates”. In this way, Tesla viewed the Earth as a massive spherical capacitor. The Vdd plate shown left (the Earth’s surface) becomes the Vss plate for our next step since the energy we are considering is cascading through charge path segments. The next step is described below and corresponds to the next two images. Step 6: The energy from the charged ionosphere (charged by the sun) now charges the Earth’s surface. Here is the most convenient opportunity we have to possibly detect some physical expression of these dynamics at work. Here we may be able to develop some evidence that one can tap the electrical energy flowing to the Earth from the sun. 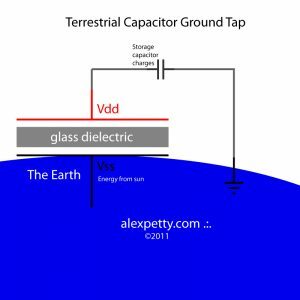 Step 7: Tap the Earth’s “vast reservoir of negative electricity” by constructing a Vdd plate to receive electrical energy from the Earth’s surface, the Vss plate. 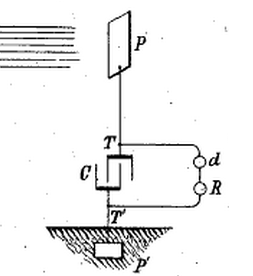 I imagined this plate to act as the “radiant receiver plate” shown as component P on Tesla’s drawing below. My arrangement (shown below) is the same as Tesla’s (pictured above), however, with the exception that rather then using an aerial ”antenna-like” receiver, the plate in my drawing is designed to receive charge capacitively from the surface of Earth, the “vast reservoir” of charge. I am not discounting the “antenna” approach as their exists much evidence of its merit in the work of Dr. Thomas Henry Moray. I am just sharing with you my experimental approach. 7b) Place a sheet of metal on top of your dielectric to form a top plate for your “ground tap”. I find that aluminum sheet metal which you have polished to a high shine yields the best results I’ve seen so far. Step 8: Make a storage capacitor by attaching one end of a capacitor to your Vdd plate. Tesla said that this capacitor should be of “considerable electrostatic capacity” and should be very well insulated in view of the fact that the electrical energy is supplied at a very slow rate to the condenser”. Step 9: Attach the other end of your storage capacitor to a ground rod that is driven solidly into the surface of the Earth. Step 10: Measure the voltage across the terminals of your storage capacitor. You will see that the capacitor charges to about 1.25 volt DC within several minutes. This result will vary depending upon the quality of your storage capacitor. I have seen that lesser capacitors in my inventory can only be charged to 0.5 volts. Tesla offers guidance about the construction of this capacitor noting “I use by preference the best quality of mica as dielectric, taking every possible precaution in insulating the armatures, so that the instrument may withstand great electrical pressures without leaking and may leave no perceptible electrification when discharging instantaneously”. It may be the case that Tesla’s capacitors were built so extraordinarily well that his capacitor’s charged “indefinitely” without any leakage occurring. Tesla states that he observed his storage capacitors to charge to such high pressures that his capacitor actually ”ruptured” or exploded. This implies that he had achieved close to zero leakage in his constructions and that his storage capacitors charged slowly up to very high voltages. For my case, while 1.25 VDC is not very much charge pressure, it does serve as compelling evidence along these lines of inquiry. Encouraged, I wondered, how I might be able to open the flood gates of energy that Tesla claimed is available right under our feet? It can be calculated that the earth has a static electric charge of 96,500 coulombs. Capacitance is equal to the charge in Coulombs (C) divided by the charge pressure gradient (voltage, V). The charge pressure gradient that exists between the Earth’s ionosphere (Vss) and the planet’s surface (Vdd) can be shown to be 360,000 volts. Plugging in these parameters to the formula we see that the Earth is a massive spherical capacitor with a capacitance of 0.25 farads. This “sink” must be at a lower energy state than the surrounding medium and in order for energy to continually flow into it, energy must also be continually pumped out of it. In other words, the oscillations delivered to the load must be tuned to the oscillations driving the “sinks” pumping action while still providing sufficient charge pressure and flow to meet the electrical needs of the load. But how can we make an “energy sink”? How can we create Tesla’s “cold hole”? Tesla offers some food for thought on this question. Tesla goes on to further describe how we might produce a cold region in a given portion of space and thereby cause heat to flow in continually. The “sink” or “cold hole” that Tesla is suggesting is a coil that is set into oscillation at its resonant frequency by an external power source. If the coil can be made to exist electrically at a lower energy state the surrounding medium, then during this low energy cycle of the coil’s operation, it will appear to other parts of the system as the Vdd plate of a capacitor. In my own experience, using only the capacitor’s available to me mostly from scavenged electronic parts, that my best capacitor in terms of exhibiting low leakage during slow charging, is capable to receive passively from the Earth an electrostatic charge of 1.25V DC within a period of 2 minutes. I have measured the capacitance between the Earth’s surface and my aluminum plate to be approximately 1.5nF. My results have also confirmed Tesla’s observations that that larger surface areas yield higher charging. While 1.25V DC is a very small amount of charge pressure and while not sufficient for developing a truly useful effect, it is certainly a good start! The question then becomes how can we excite local charge (within the Earth) to oscillations sufficiently high to produce useful power? This is the very issue that Tesla spent a lot of time on. A good number of Tesla’s more interesting inventions involve the use of resonant circuits capable of inducing high frequency oscillations. From my tests to date, I feel encouraged that using Tesla’s methods, it may be possible to arrange inductors in relation to a storage capacitor in such a way as to induce oscillations of local charge within the Earth. If the amplitudes of these oscillations can be made sufficiently high, they could yield useful results. So far, I have not been able to achieve this effect in the least, but I think it may be a matter of trial and error in building coils and electronics tuning.